Looking for opinions,ideas on a proprosed engine upgrade for my BAM engined TT track car. Currently running 275bhp and 300Lb/ft of torque I am happy with the weight reduction, suspension mods, brakes etc car just needs some more oomph down the straights. Looking at hybrids an AET 380 would definitely have more go but having to replace the rods, clutch , injectors etc thinking I may as well push the boat out and fit a big turbo. Not looking for a dyno queen I want good strong power with a decent powerband that will be reliable on a track. Thinking 450-460bhp without using WMI to try and keep EGT's and IAT's under control. Thus looking at a G25-660 0.72 V-band turbo. I know a G25-550 will make the target power and spool better but this is a track car and the 550 isn't any where near as efficient at the top end. Will be keeping the standard intake and head but plan to replace exhaust valves with Supertech items and looking for a reliable 7500 rpm limit. A 6758 makes good power on a 1.8t with good spool and the G25 will hopefully provide similar spool with a stronger top end. Certainly at the top end where it will be spending most of it's time it's very efficient. 38mm Tial MVS wastegate, Bosch 1000cc injectors. Car already has a straight through 3 inch exchaust system and a DW65 fuel pump along with a wellycooler style FMIC. Rods, looking at PEC, IE , ZRP any suggestions or places for rods at a decent price. Clutch will be an LUK DMF pressure plate and a Sachs Paddle clutch, seems to work for several well sorted cars. Thoughts and ideas welcomed. Also places to buy parts and stuff at a good price. I got my rods from tsr-performance. They where zrp 20mm rifle drilled. They where a good price aswell. JonnyDerv and desertstorm like this. When looking at some Tuffty data logs uploaded he was hitting something like 550 EGTs on 100% load on a run even in May/June, that's idle on a k04. I actually thought you already had forged connecting rods, because you track your car. I suppose you can sell the downpipe and tip and keep the other mods. Are you thinking about going stroker? @badger5 thanks for the reply, I was hoping to use the TSR manifold and the associated downpipe. I was hoping this was going to be an easy solution to fitment and using a 38mm TIAL wastegate works out cheaper. Would I really need the larger wastegate with this set up? Seems nothing is so easy these days, Do you do a downpipe that would fit this turbo, I don't want to use a screamer pipe. @JonnyDerv not looking at a stroker. Well at least not yet. Turbosmart hypergate FTW. Not exactly what you’d call cheap though, tend to be around £300 or so new. You absolutely need a 44mm gate. When you're trying to squeeze the most from a turbo, with all the boost, you can possibly get away with a smaller gate as you're not looking to bypass the turbine all that much. If you're wanting a sensible boost level you're looking to bypass the turbine and divert a fair bit of the flow, so you actually want a bigger gate for a lower power target. I've seen very good things of the EFR range when used in the right application. is a 6758 available with a 0.6x hot side? The G25 660 0.72 seems confused to me. the new G25 are supposed to spool sooner because they're a much smaller turbine (which will likely run hotter than a gt30 sized larger turbine), but then you go and kill some of that spool with a larger hot side? It seems like it's negating the gains of the new technology that's allowing a smaller frame to make more power. Manifold wise I would definitely look at Bills offerings, they are exceptionally high quality and from what I've seen they have ironed out the fitting niggles you can get with the TSR mani / dp packages. I think you'd be best off with one of Bills manifolds, then a custom made downpipe to suit your car. Head wise you definitely want to be fitting springs on the exhaust side whilst the valves are out at the very least. The rest is a gamble that some are prepared to take, but springs really ARE a necessity. Look forward to seeing how this progresses! what do you think ours is?? Downpipe is made to order at same time of manifold so is available yes. Thanks @Prawn @badger5 @<tuffty/> for the feedback and information. Looks like a Badger5 manifold and downpipe with the 44mm gate then. Exhaust valves and springs. Any ideas on injectors? Seems for my needs something around the 1000cc mark is required if I want to run them at 3 bar. They need adaptors to fit and these seem to do the job. Any idea where to get the valves and springs, I assume just require the Exhaust springs. 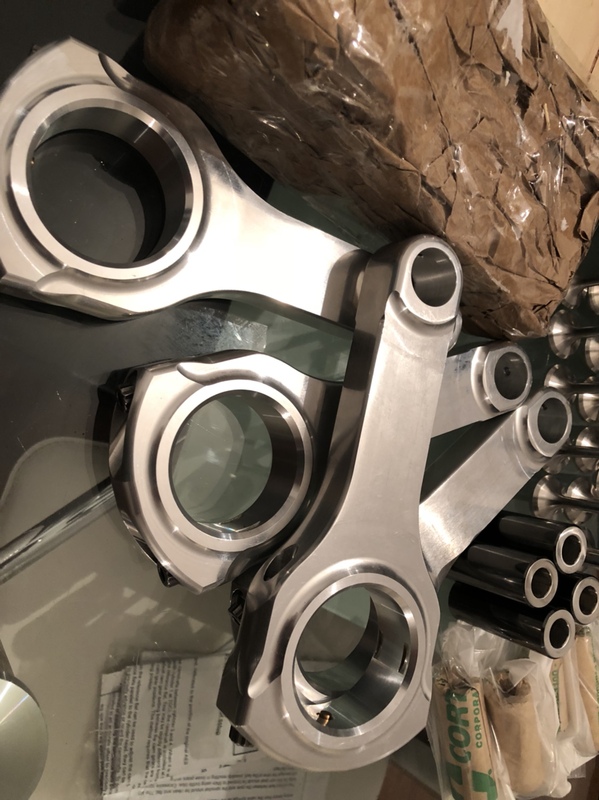 https://www.tsr-performance.com/web...-connecting-rods-20mm-pin-h-beam-r-aud-001hl/ and some ACL bearings. Well Turbo arrived today. I was a little surprised how small it was especially the turbine wheel. Started collecting parts for the build. Injectors ordered with hopefully the correct spacers. Picked up some Kolbenschmidt sputter rod bearings for the rods. Think the manifold and downpipe will be from Bill along with a few other things such as Supertech exhaust valves and Cat cam spring set. Debating a little on the rods but looking like the PEC rifke drilled items. Question is I beam or H beam. There must be pro's and cons of the two. The only thing I have found is that the H beam is possibly better for higher torque applications. Anybody have any thoughts on this. The turbo seems to come with coolant and oil fittings . Any links to pre made oil drain / feed and coolant lines or do you make these up yourself? . I would say the other way round. I beams seem the tougher shape to me... Heavier tho slightly. It’s abit of a mine field trying to find out whether I or H beam is best, always seems to come down to “it depends”. A H beam quality steel rod is better than an I beam lesser quality rod. Generally people seem to say I is stronger (probably because I comes after H ). Personally, I think the vast majority of people aren’t running anywhere near the power/torque to worry a quality H or I beam. I would go with a top manufacturer’s rods and you’ll be fine. having seen a few H beam rods develop a "wibble" on their edge, I beam is my preferred high torque type rod..
That’s interesting, same brand? Possible bad batch? I know of very high powered jap cars on H beams without issue. But it’s the same as everything car related, depends on many factors. Personally I wouldn’t dismiss a rod because it’s H rather than I though. I’m waiting for Z rated rods. When I was looking to choose between the PEC Rifle Drilled H and I Beam - it appeared "I" were suited for 600BHP and higher revving engines? it's certainly confusing when a manufacturer chooses to make both types for the same price with no definite application differences? Looks like I beam rods then. How much heavier are they compared to the H beam. Been looking around and can find no manufacturer figures for the weight. H beam are around 550g aren't they?. @badger5 what does the badgerwagon run ? On the PEC site it says they are lighter? And designed to go to 9500rpm where H news only good for 8000rpm. hydro s3 and desertstorm like this. Not sure it would make any more power but I bet it would probably spool a little quicker. Anybody used Rosten Valves or springs? They seem to get good reviews on the googhle searches I have made. Seem to be quite good prices for the spec. Got Rosten springs in my head, not installed the engine yet, so yet to see how they perform. 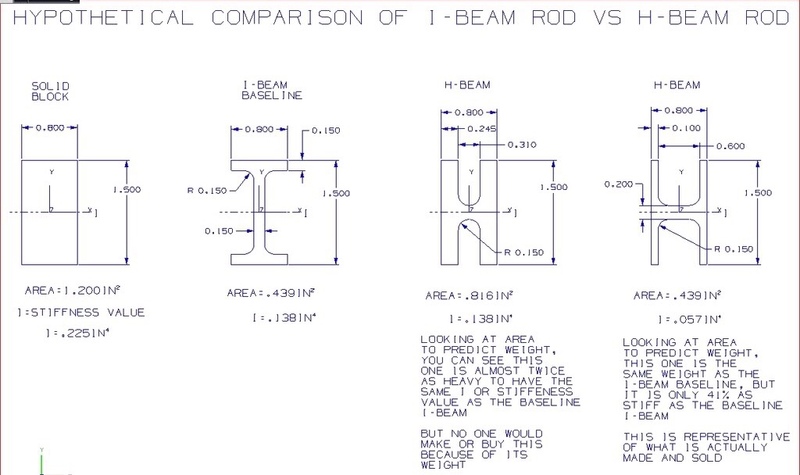 The I beam and H beam debate can go both ways depending on weight and qty of material. From what I understand is that for a given weight the I beam is stronger. I'm dead keen to see how the g25 does. 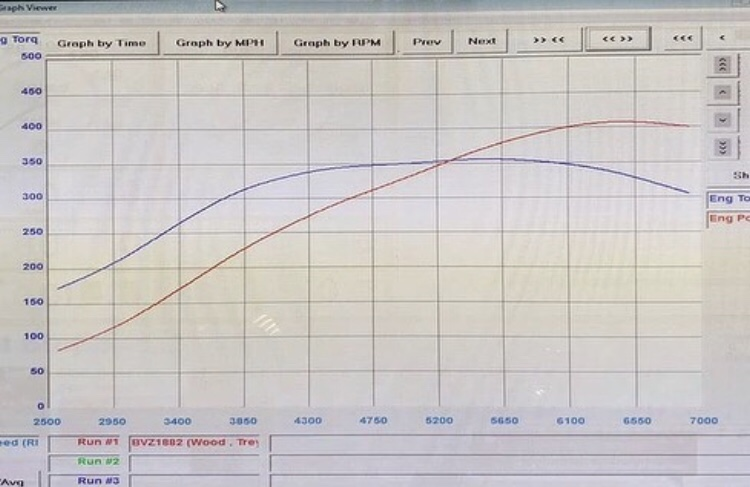 Without the full picture you can't read too much into that BRZ plot, but on face value alone its a shade over 400bhp and not spooling fully until after 4k. If that's gate pressure and 13psi then it appears good again. No boost control getting it going so slower start is to be expected. So many variables. I've seen one from a megane claiming the same power as a 3071 but 600rpm gains in spool. Until we see one on a 20vt its all guessing games! I did come across this article which does a back to back with a G25-660 and a GTX3076 . Looks promising to me. The G25 was on a 0.92 hot side and still manages a much better response than the GTX. Although this would have helped it at the top end to makes some more power because of the improved turbine flow. At the end of the day this is the first time in god knows how many years that Garrett have revised the turbine side of their turbos. More reading comparing the specs of the G series turbos with comparable Garret items. And this makes a good read, originally designed with anti lag they had to remove it as the turbo was too responsive. Can't even compare 1.8t to 1.8t... never seen similar hardware perform exactly the same.. I agree with you difficult to compare as you aren't comparing apples with apples. Too many variables but the comparison on the STI is interesting. Need to get on and get more bits ordered. Interesting thing I found on the SuperTech site when looking into the difference between Rosten Stainless valves or Supertech Inconel items. Q: What are the operating temperatures of the valves? Converting those temps to degrees C.
The fact that the Rosten valves are one piece and not hollow should make them a lot more sturdy than the standard items. I think I would be worried if EGT's were over 1000 degrees C.
Rosten do Inconel valves for other applications mainly turbo diesels but not the 1.8T.